The Edakkal cave (or Edakal) which is famous for ancient cave pictures is in Ambukuthimala near Ambalavayal in Wayanad. The cave paintings here are very old and are carved on the walls. Most of the pictures are about ¾ to 1” wide and 1” deep, with sharp pointed lines at both ends. The pictures feature human forms performing dance of a ritualistic nature. All human forms are seen wearing a kind of headgear that seems to be made of woven leaves. Figures of elephants, hounds and deer are also seen. Apart from these are geometrical patterns and the figures of wheels with spokes, cart with wheels and so on. 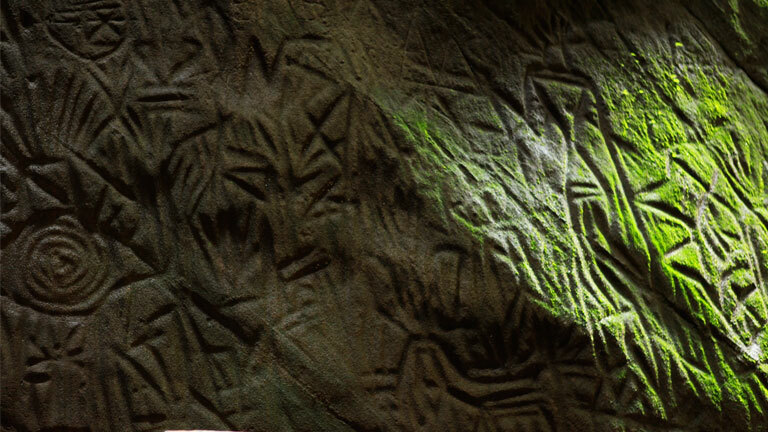 It is believed that the Edakkal paintings were drawn during the New Stone Age. Similar cave paintings are also seen in Poorappara, a rock cut cave in Thovarimala. Pictures of weapons such as arrow and crossbar; and those of birds are also seen here. The Ezhuthalai cave in Marayoor has paintings of elephants, horses, bison, and deer. Incomplete paintings are also seen here and it can be assumed that the paintings in Ezhuthalai have been drawn during different time periods, from the fact that they are drawn one on top of another. Other ancient forms of Kerala paintings include wall paintings or murals, the paintings made with coloured powders for rituals like Kalamezhuthu, Kolamezhuthu, facial masks and facial paintings. Besides wall paintings, all the others are part of the folk tradition of painting.